We know our members are a little, ahem, ga-ga for swapping. As many Girl Guides gear up for summer camp, we’re re-posting one Guider’s confession. Hat crafts. Traders. Swaps. You can call them whatever you want. I call them “my addiction”. My name is Alana, and I am a swap-a-holic. It started innocently enough. 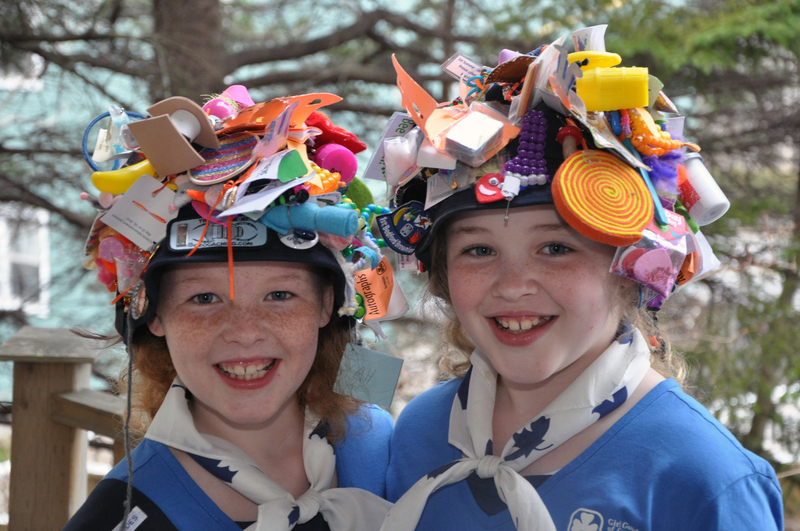 When my daughters were Sparks, a fellow Guider showed up at an event with her camp hat. I thought, “How cute! We’ll have to make some at our sleepover.” And so we did. Then we made more at camp. And more the next year. Five years later, my camp hat has gotten so heavy that I have a permanent crick in my neck. I don’t know why, but those tiny little crafts really appeal to me. Our collection has grown to include seven hats, four banners and hundreds more we simply have no place to put. I can make a hat craft out of anything. Springs from the inside of pens and bits of coloured wire left by the phone repairman are perfect robot parts. Tiny bits of fun foam are just the right size for ears on inch-long bunny slippers. Broken pencils? Keep those! They’re perfect for Yahtzee-in-a-film-canister. And speaking of film canisters, I have hundreds stored in my basement… just in case! I’ve created an army of swap-a-holics. My Guides want to make hat crafts all the time. They come up with new ideas, and bring them in to share. I love seeing how the girls take an idea and make it their own. We hosted a Thinking Day Swap Exchange, where we had 80 Sparks, Brownies and Guides come together to make and trade hat crafts. It was an awesome night, and we saw amazing creativity from the girls and Guiders. But why limit yourself to face-to-face trades? The Internet has let us connect with other “hat craft addicts” all over the globe, and we’ve traded with girls from Alaska to Australia. We pin them to a world map, and use them as a tool to learn about WAGGGS. If you’ve never made a hat craft, there’s no time like now to start! Hit Pinterest, Google and Facebook for tons of great ideas. And e-mail me. Because, you know, it’s an addiction. Alana is a Guider with the 2nd Bedford Guides. This entry was posted in Awesome Activities, Camping & Outdoors and tagged camp, crafts, creativity, hat crafts, meeting ideas, swapping, traders. Bookmark the permalink.